Today is the first anniversary of the Day Nursery Early Edition blog. During our first year we had 8,083 visits and increased our readership every month. The highlight of the year was being named in the Top 50 Blogs in Indianapolis by social media leaders Kyle Lacy and Lorraine Ball. In June, Day Nursery started “tweeting” and we have incorporated those updates into the blog. The most clicked item in our blog was the “About Us” page because many of our visitors are first timers. The second most visited post was a tribute to our friend and co-worker Kathy Klatte, who passed away unexpectedly in March. Any time we post pictures of children having fun in our center it is a good day on the blog. Our Friday Feature, which highlights a specific Day Nursery center, has been popular too. Look for a feature on our Federal Center later today. Day Nursery is 110 years old this year. Who says you can’t teach an old dog new tricks? The new exhibit from Reggio Emilia , Italy I wrote about last month is now open at the Indiana Statehouse. This is the exhibit’s first Midwestern stop and only its third appearance in the United States. 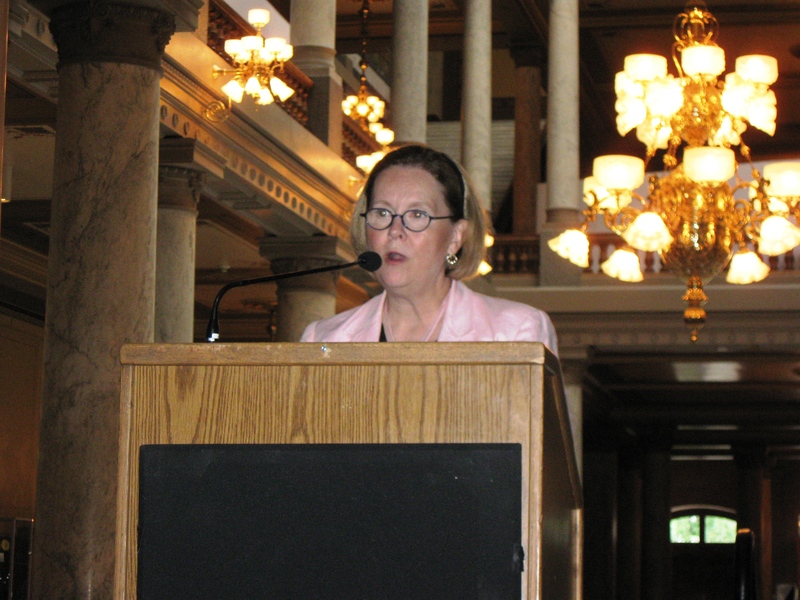 Dr. Ena Shelley, Dean of the College of Education at Butler University addressed a crowd of supporters July 17 at the ribbon cutting ceremony. “The Wonder of Learning the Hundred Languages of Children” is a continuously updated travelling exhibition that has been telling the story of the Reggio Emilia educational experience worldwide to thousands of visitors for over 25 years.” Dr. Shelley mentioned in her remarks that educators from as far away as Ontario, Canada have indicated they are going to visit the exhibit which runs through December 18. 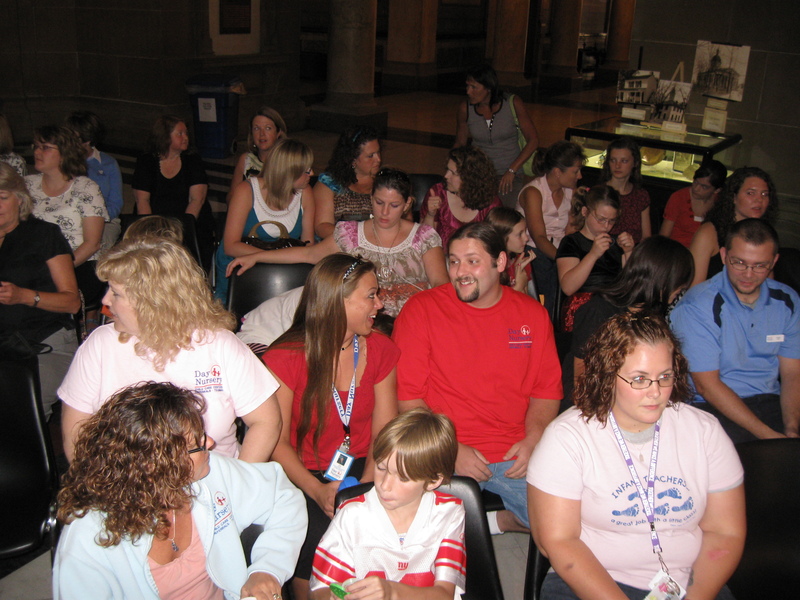 The exhibit starts near the rotunda on the first floor of the statehouse and continues on the second and third floors. The exhibit is free and open to the public. 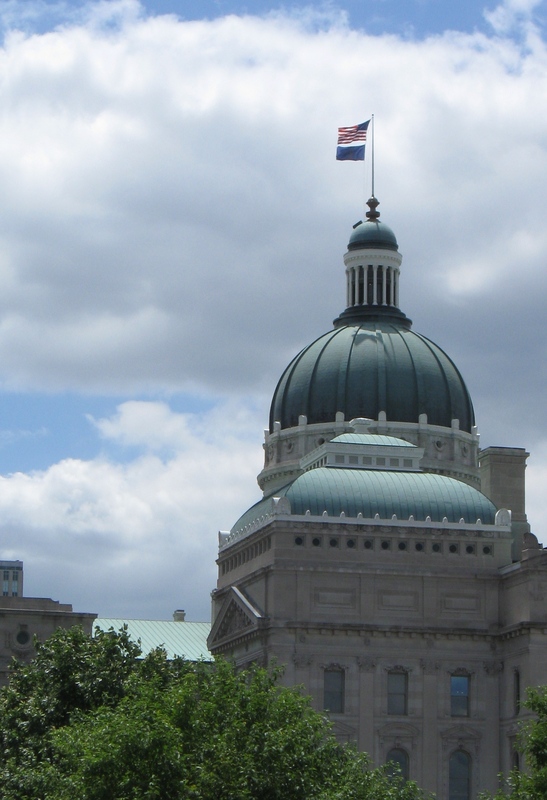 Statehouse hours are Monday- Friday 8:00 am – 5:00 pm and Saturday from 10:00 am-2:00 pm. Click on any of the pictures below to see a larger image. Several Day Nursery Center Directors and staff were able to attend the ribbon cutting. Many early childhood educators were on hand for the ribbon cutting. 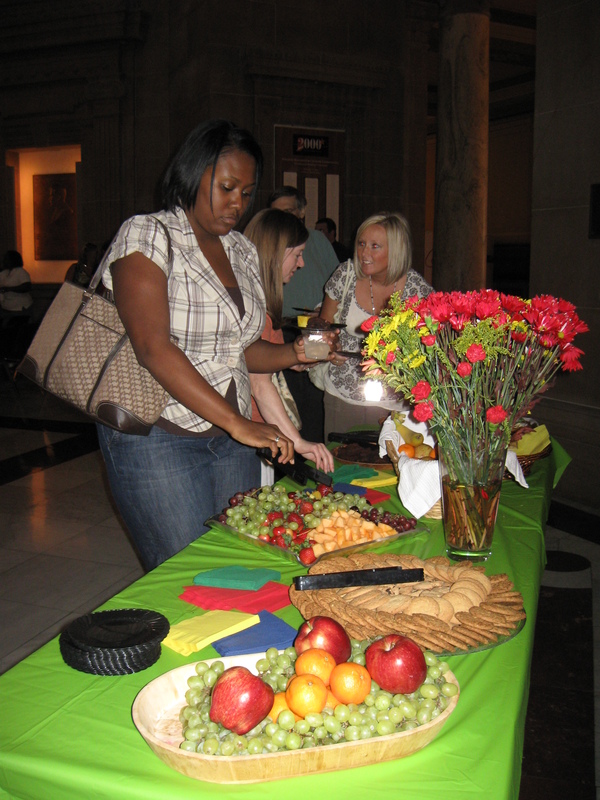 The Reggio Emilia Exhibit is located on the 2nd and 3rd floors of the Statehouse. You can start your journey on the first floor on the west side of the Capitol Rotunda. 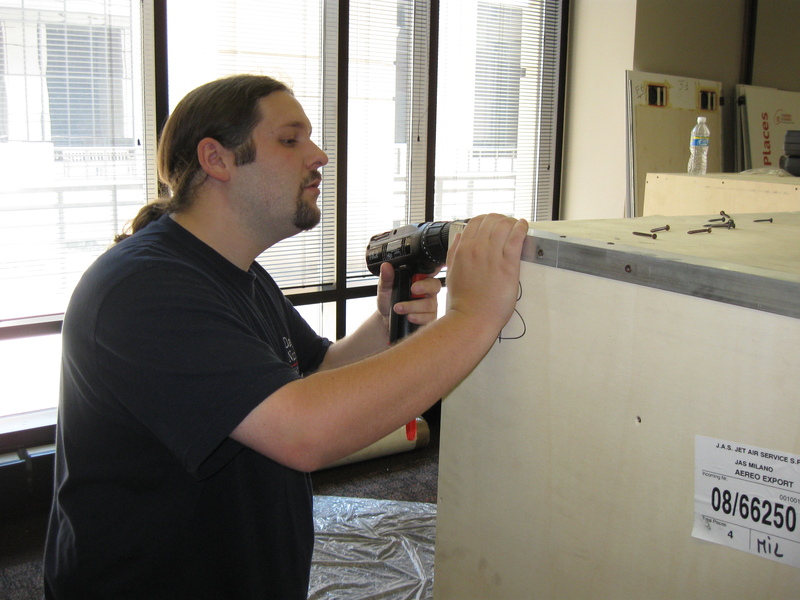 Day Nursery Avon teacher Matt Miller helped unpack the nine crates that held the exhibit. The brain is an amazing organ that allows each of us to think, feel, learn and act. It is exciting to know how experiences can have a positive impact on the developing brain— and it is not complicated to understand! Join early brain development specialist and award winning author, Deborah McNelis, for a free webinar, Brain Development: You Can Easily Make A Positive Difference! to learn how, with simple, enriching activities, you can make a positive difference in the connections made among your child’s 100 billion brain cells. This webinar will take place Wednesday, August 5th from 8:30-9:30 EDT and will be interactive, and you can ask questions. Sign up now. This webinar bought to you by the Child Care Aware Parent Network. Thought I would share this email and photo I just received from Marti Thiery who is the Assistant Director at the Day Nursery State Government Center. Tim Tegarden and Connie Anderson in Preschool 5 had an experiment today. They used a 2 liter of Diet Coke and Mentos candy. They asked the kids what would happen if they put the Mentos in the Diet Coke. I could hear the kids squealing with absolute delight all the way down in my office. They made a huge mess (Tim cleaned it up) but they had a blast. They learned about chemical reactions and cause and effect. They repeated the same experiment outdoors. Notice Connie’s “rain gear”. She was unaware of the outcome of the experiment. It was priceless! Hope you don’t need any rain gear this weekend! Have a good one! If you are thinking of enrolling your child in Day Nursery or you are a parent of a Day Nursery grad heading off to elementary school, I think you will enjoy this list of the top 10 children’s books for starting school compiled by Elizabeth Kennedy at About.com. She has been an early childhood and elementary teacher and always leads me to great new books to explore with my daughter. On July 15, Representative George Miller, the Chairman of the House Education and Labor Committee, introduced the Early Learning Challenge Grants Fund legislation. This measure provides $1 billion per year, for 10 years (a total of $10 billion) to be used by states to strengthen early learning programs. The goal of the legislation is to significantly increase the number of disadvantaged children in high quality early learning settings. The House Education and Labor Committee is scheduled to consider the bill on Tuesday, July 21. With the Committee considering the bill Tuesday, we urge you to contact your Member of Congress today to express your support for the legislation and request your Member’s support. The Committee is scheduled to vote on Tuesday, July 21. Therefore, there is not much time. To send an email to your Member of Congress in support of Chairman Miller’s proposal, click here. Tell your friends, family, neighbors, colleagues, and others how important it is for them to contact their Members of Congress in support of the Miller Early Learning Challenge Grant proposal. All children should start school ready to succeed. We can do that by strengthening early learning programs, including child care, throughout every community. The Miller legislation will help us get there. It’s a huge step forward and a real opportunity for states to ensure that children are in high quality settings. Take action today! Lukas wanted to take this little guy home. The Day Nursery Hendricks County Early Care and Education Center held an open house this past Thursday to encourage new families to tour the facility. Despite the fact that our Avon Center has been open three years this month, we have heard that many people in the community still don’t realize that the center is on the Clarian West campus or open to the public. Five year old Zach enjoyed riding Diablo. To jazz up the open house a bit, we hired a local company, Giddy-Up N’ Go owned by Jennifer Mundy to bring pony rides and a small petting farm to visit our center. I was very impressed with their way with children and would highly recommend them if you are ever looking for someone to provide pony rides. Many families stayed to let their child ride or learn more about the farm animals on hand. Here are a few pictures. If your child rode a pony on Thursday, stop by the office and ask Joy to see if we captured a picture for you to have as a souvenir. If you are visiting our blog to find out more about Day Nursery and would like a tour of our Avon Center, drop in or call 271-2603 to plan a visit. A goat, a rabbit, and a rooster were among the animals that the children could see up close.